One of their products is the Vermont Grill Dryglaze. The Dryglaze blends contain sugar which when put on top of meat that has been rubbed with oil, melts, forming a glaze. They also contain a variety of spices. The package warns you to avoid direct heat, as the sugar burns easily. The Vermont Grill blend contains Maple sugar, plus pepper, sage, ginger, paprika, fennel, thyme and nutmeg. I have used this blend before and it gives the meat just a slight maple flavor and a nice savory taste. I wanted to have a little stronger maple flavor, so I decided to modify things a little. 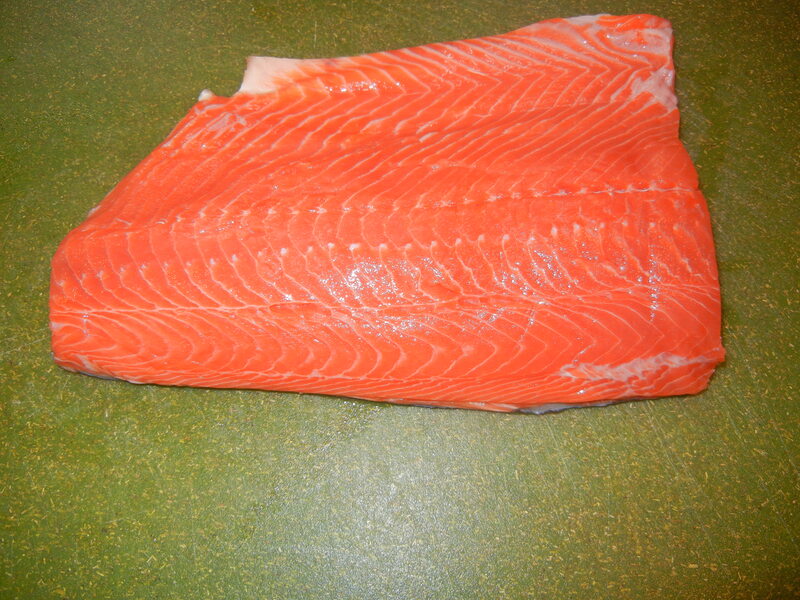 First I rinsed off the salmon filet and patted it dry with a paper towel. 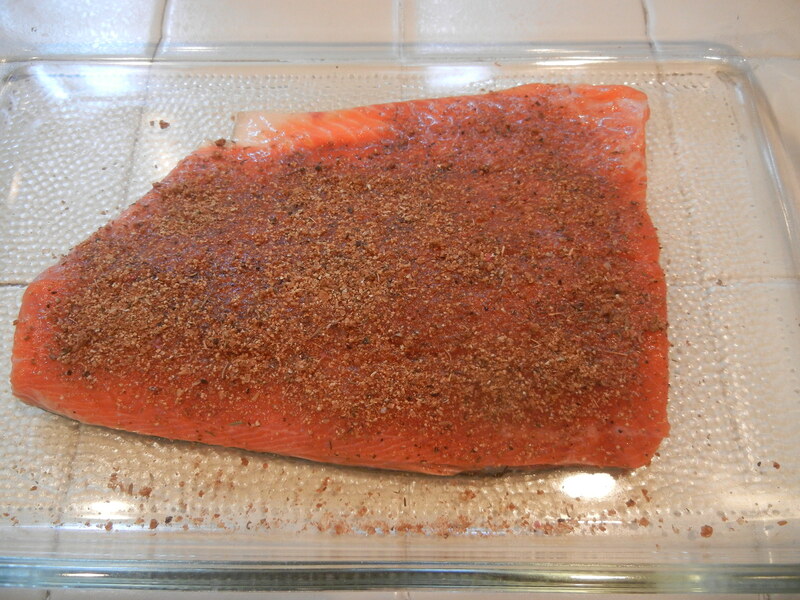 Next I rubbed the salmon generously with some olive oil. Then I poured about 4 tablespoons of pure maple syrup on the salmon. We use the pure maple syrup rather than Aunt Jemima or other syrup substitutes, it just has a better maple flavor. Finally I coated the salmon with the Vermont Grill Dryglaze and let it sit for about 20 minutes. 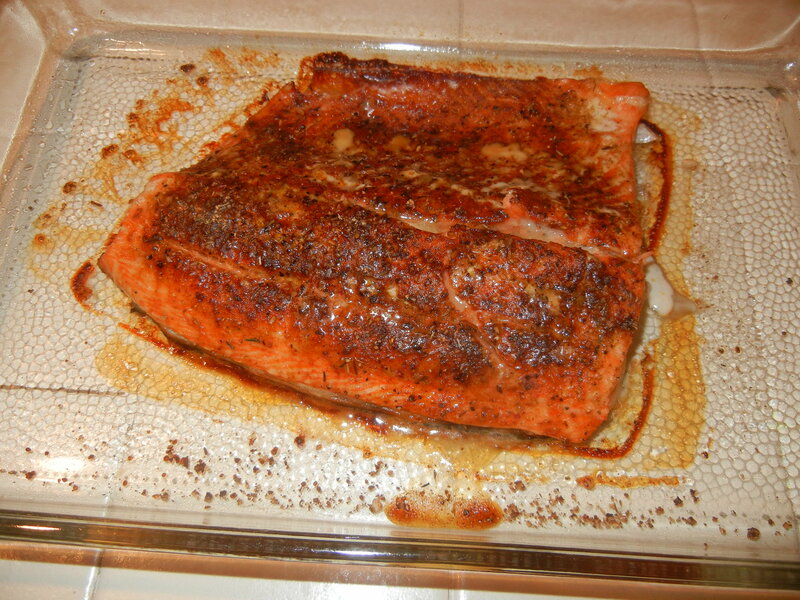 Now normally I would grill this salmon since clean up is easier and I like the smoky flavor you get on the grill, but it happened to be raining in Maryland that day, so I had to cook it in the oven. Our oven has a Roast setting which is a combination of bake and broil, so I used that for the salmon. It only took about 15 minutes at 350 degrees for it to cook. I served this along with some fresh corn on the cob and it made a great Sunday night meal. As for the wine, in case you have missed some previous posts, nothing goes with salmon quite like a Pinot Noir. It really is a match made in heaven. In fact that might be why we have salmon so much, hmmmm. Anyway, I pulled a 2005 Dehlinger Goldridge Pinot Noir to go with this dish. I wanted a pinot that had great earthy flavors, but was not too overdone. What does “overdone” mean? Well, some American winemakers make Pinot Noir in a big, rich, over-extracted way, to more closely match the tastes of their consumers. I didn’t want the wine to overpower the flavors in the salmon, so I wanted a lighter style. The Dehlinger wines are a bit lighter in style and a wine with 7 years of age has lost some of the “baby fat” that they have at release.